Keeping hydrated is one of the most important factors in assuring a phenominal hiking experience. Drinking enough water helps maintain energy, staves off dehydration and reduces the risks of heatstroke. But figuring how much water to bring on a hike can be confusing. Carry too much of this heavy stuff and you’ll be weighed down. Carry too little and … well, you don’t want to be in this situation! When figuring out how much water to bring on a hike you’ll need to consider the mileage, difficulty level, temperature, elevation and the remoteness of the trail. If you’re trekking far from civilization – always err on the side of having too much water, and bring a water purification system just in case you run dry and have to tap natural sources. 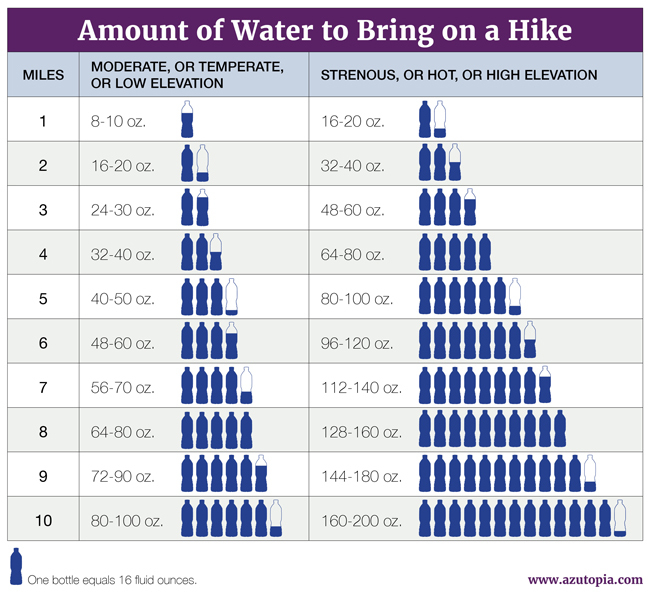 What’s the Best Way to Carry Water on a Hike? Of course, there are better ways to carry water on a hike, than totting around a bunch of loose bottles. Hydration backpacks, by companies like CamelBak and High Sierra are great options, and offer various size interior bladders to match your hiking needs. Water belt systems, from companies like Everest, are ideal for shorter hikes. Note: Although the primary goal of azutopia is to provide awesome hiking information, I will receive a small commission (to help offset the costs of hosting the website) if products are purchased via the links above. 1. Down a tall glass of water before heading out the door. This helps you kick off your hike fully hydrated. 2. Avoid caffeinated drinks, such as coffee, tea or soda, before hitting the trail, as these increase dehydration. 3. Take small drinks, as soon as you begin to feel thirsty. This wards off dehydration and the resulting fatigue. 4. 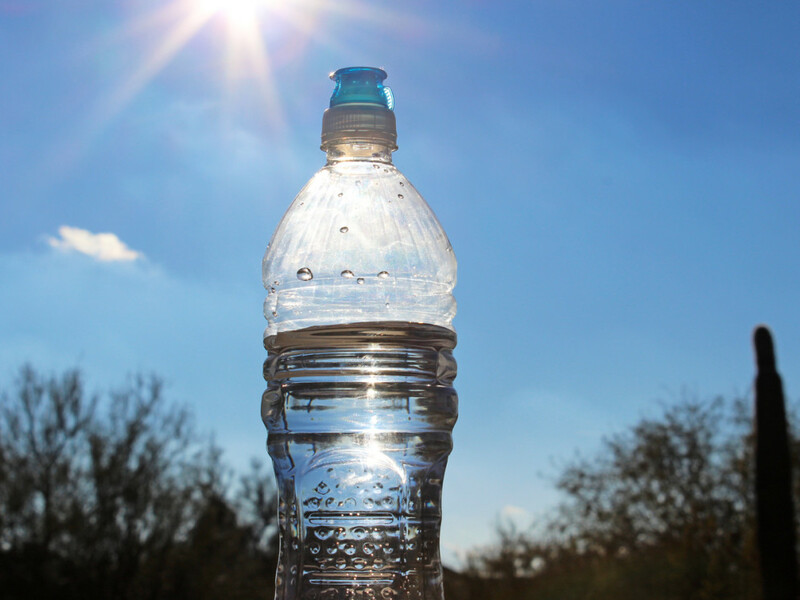 In hot weather, or on very strenuous hikes, consider bringing a sports drink, instead of water. The electrolytes in these drinks help replenish salts lost through sweating. A potassium tablet will also help to replenish lost salts. 5. Purify water from natural sources before drinking it. Lightweight straws or iodine pills that filter or kill the gastro-intestinal illness causing bacteria, Giardia Lamblia, are readily available for purchase. 6. Drink another tall glass of water as soon as you finish your hike, to replenish any needed fluids.